After a long delay (where did two years go?!?) I am going to start updating the site with new content… long overdue! I’ve started by updating the site. I think it looks pretty cool. Nice and simple. I’ve also just added a DIY projects page which will contain various DIY projects I have completed. 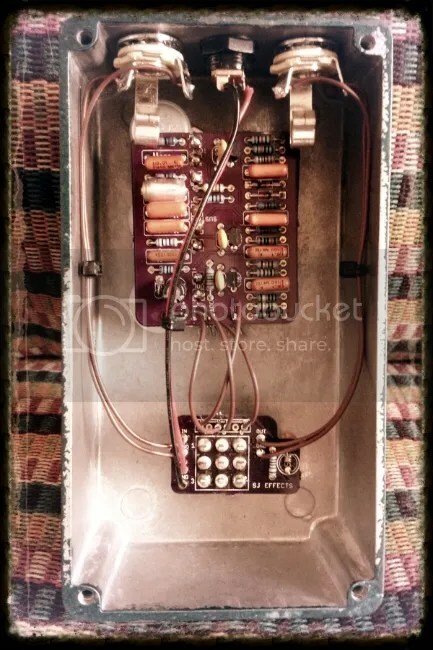 Schematics, and links to buy PCB’s from OSH Park can all be found in the project info. Been a long time since my last post… 2014 has flown by! 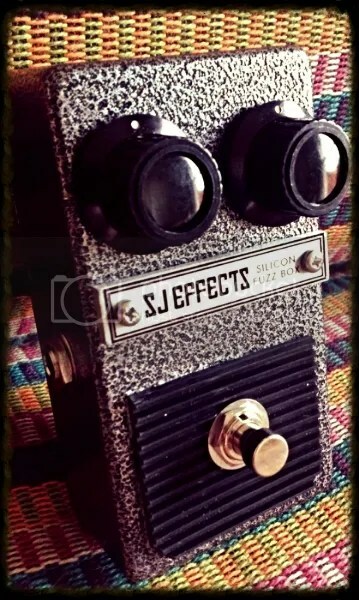 Below are a couple of different builds that have been built up at SJ Effects past couple of months. I have also been building some up the ‘standard’ line to order (Tesla, Goldcrest, Gray Train) which are being well received by customers. I am also currently working on a new revision of the Tesla Cannon fuzz that will have some new features, and will also have easier external access to the clipping switches (customers have found experimenting with different combinations fun). 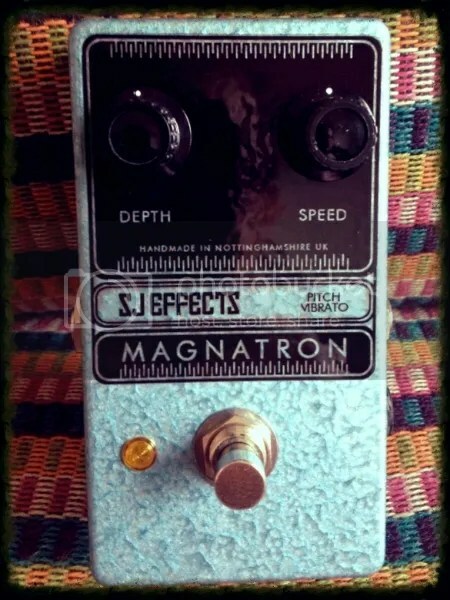 I hope to have that one ready for early 2015 along with another fuzz design. There are also other exciting projects in the pipeline that I am working on, but I want to keep them under wraps until they are 100% complete and ready to rock! I also have some other designs that I am hoping to release as ‘open source’ for fellow DIY’ers to build up, order PCB’s for etc. Hope everyone has a good Christmas… and take it easy on those mince pies! 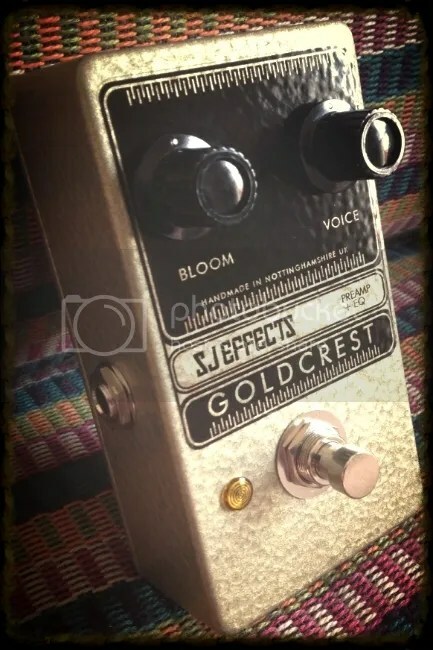 New Standard Pedal: Goldcrest Boost + EQ! 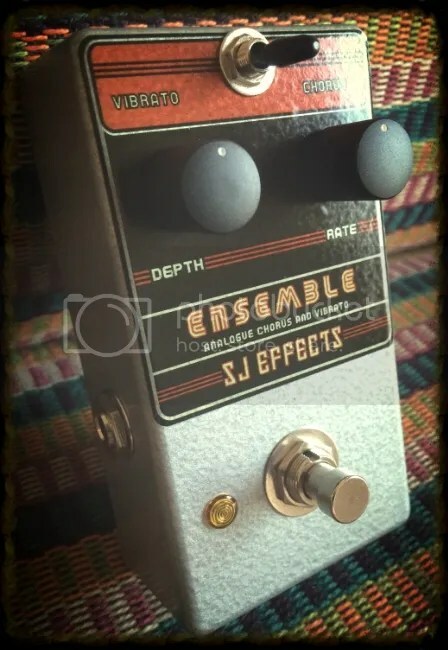 I’ve added another pedal to the SJ Effects line; the Goldcrest Boost + EQ. I’ve been working on this one for a while, and have finally got it to the point where it is ready for release. 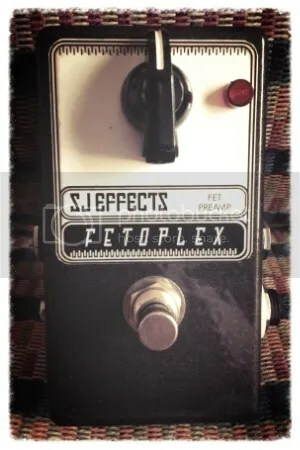 It’s a preamp and EQ (based on the old ’tilt’ hifi eq circuits) pedal that has been optimised for intuitive use and great results. 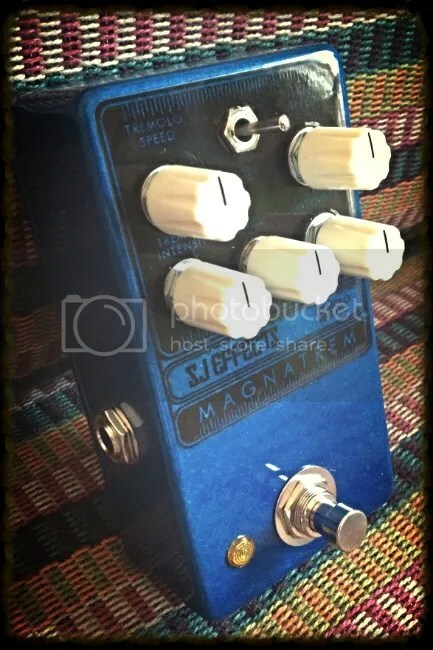 It sounds great, and utilises audiophile quality OPA2134 op-amps throughout the signal chain. I’m currently in the process of getting some demo clips and video together. I had some spare time so finished this one for myself over the weekend. 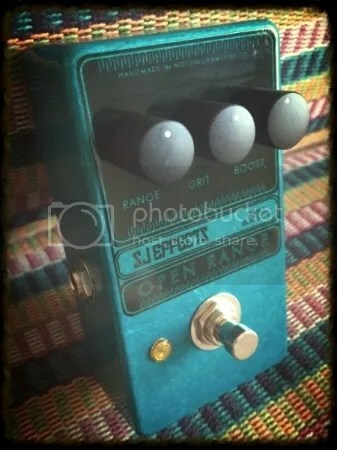 It’s a clone of the old B+M Champion Fuzz Unit, which is very similar to the Jumbo Tone Bender, which in turn is a derivative of the Big Muff circuit. 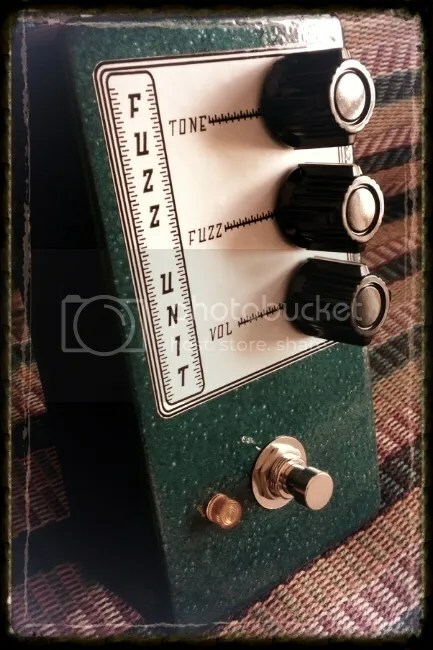 The B+M Fuzz Unit was the pedal supposedly used by Edwin Collins on the Girl Like You solo (you know the one: da derr da der der derrr, da der da der). Great song, and great guitar tones! The PCB had been sat built up on my work bench for nearly a year, so I thought it was about time to finish it off. 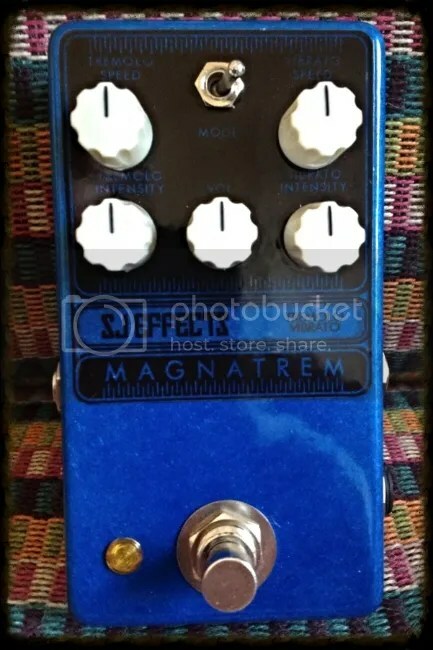 I put it in a massive enclosure with ridiculously big knobs because, well, why not! 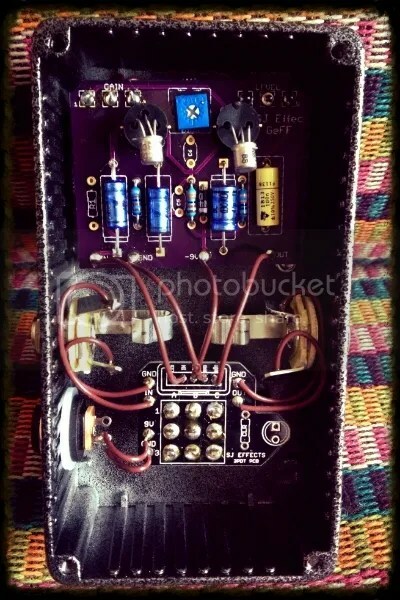 To my ears, the circuit sounds best when used with bass guitar. 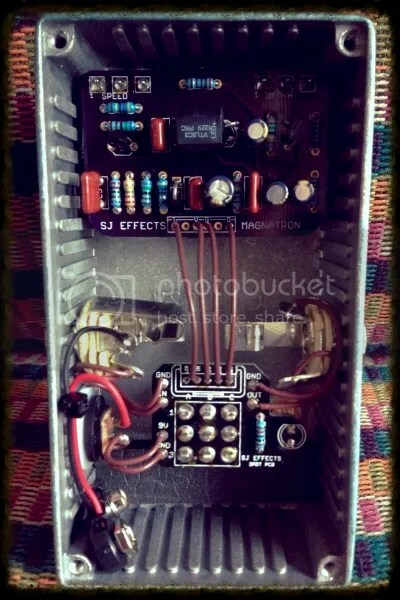 There is something lacking when used with normal guitar, and I find the conventional Big Muff circuit (and it’s derivatives like my Tesla Cannon) to be a much better fit. If you are a bass player though, it is fair to say this circuit is a must try. 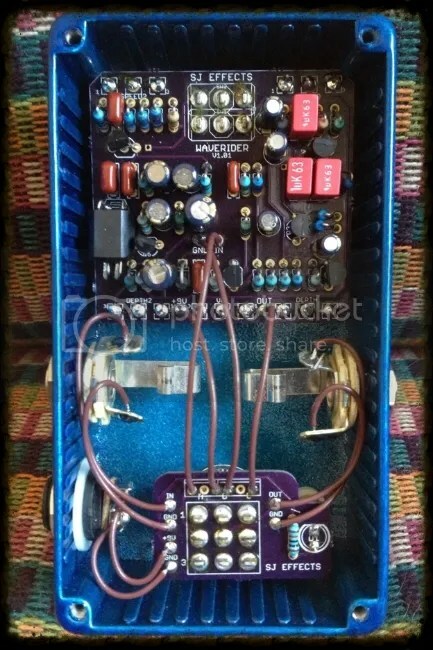 Another recent Tremolo + Vibrato 2 in 1 build I completed. The enclosure is a lovely colour, one of my favourites. 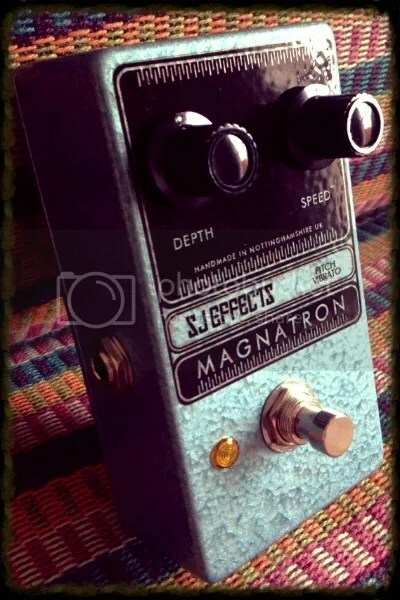 The tremolo is based on the classic EA Tremolo, and the vibrato is based on the Tim Escobedo Wobbletron circuit (modified for Vactrol LFO control) for a Magnatone amp style vibrato effect. Both circuits have independant speed and depth controls. The toggle switch selects between the circuits. The volume control is a master volunme. The tremolo has quite a lot of output volume so can also be used as a boost when the depth control is set to min.